The Super Nintendo Entertainment System (abbreviated to SNES, Super NES or Super Nintendo, Japanese: Super Famicom; also called in early development NES2 or Nintendo Entertainment System 2) is a video game console created by Nintendo. It was the successor to the original Nintendo Entertainment System and rivaled in performance to the Sega Mega Drive/Genesis. It had many popular games, including Super Mario World, Super Mario Kart, Super Mario All-Stars, Donkey Kong Country, and Super Mario World 2: Yoshi's Island. Other popular titles are Super Mario RPG: Legend of the Seven Stars and Mario Paint. It is the last Nintendo console to have a different design and name in North America. The Super Famicom was released in Japan on November 21, 1990 while the Super Nintendo Entertainment System was released in America on August 13, 1991, in Europe in April 1992 and in Australia in July 1992. They were discontinued in 1999, followed by the Famicom model and the SNES/Super Famicom games which discontinued in 2003. It remained popular throughout the 32/64 bit era, selling 49.10 million units during its lifetime. Nintendo also worked with Sony to create the planned add-on, the SNES CD to rival against Sega CD. However, Nintendo's cooperation with Sony crumbled so the SNES CD was moved to Philips for a short time. The projects resulted in the Philips CD-i and the Sony PlayStation. The SNES was re-released as the SNES 2, being released at the same time as the Nintendo 64. As well as this, it was smaller and lacked the eject button. It also could not output the S-Video and RGB signals. During the SNES era, Nintendo and Sega were at the peak of their rivalry, so in many of the Mario games there were elements that mocked the Sonic the Hedgehog series and vice versa. In Donkey Kong Country 2: Diddy's Kong Quest, Sonic's boots and the plasma gun from Earthworm Jim are seen next to a bin and labeled "no hopers". In Super Mario World 2: Yoshi's Island, there are blue hedgehog enemies that greatly resemble Sonic the Hedgehog. The SNES was based on a Japanese console called the Super Famicom. Famicom was a mix between the word Family and Computer. The two received revisions known as Super Famicom Jr. for Japan and New-Style Super NES for North America. The two redesigns are similar, but feature the same differences as the original models. 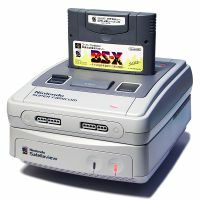 The PAL SNES is a mix between the Super Famicom and the USA SNES, keeping the design of the Super Famicom, but using the name from the USA version. Only in North America is the design different from other regions. It is possible to play games from other regions as internally the hardware is region free, but one would have to cut out tabs or get an adapter that would otherwise prevent the cartridges from making contact with the cartridge slot. The pin configurations are the same and compatible, unlike the Family Computer and Nintendo Entertainment System cartridges. Many early SNES cartridges had a long crevice spanning the cartridge. This was to prevent people from pulling the cartridges out when the system was turned on. These were produced as late as March 1993, as some early Star Fox cartridges were manufactured with this mold. Later SNES cartridges opted into a different design because people were possibly breaking their SNES units, at the very earliest of June 1993, as no Yoshi's Cookie or Mario is Missing! cartridges have this mold. The older cartridges will work on the redesigned SNES with no issues. It even lacks the tab to prevent people from pulling the cartridges out. Only North America seems to have this redesign. North America changed its logo to use a black and gray color scheme instead to preserve the colors. The SNES Controller is the main controller for the SNES which had a layout which popularized the layout used by most modern controllers. It was also the first controller to have shoulder buttons. The controller is more round-shaped instead of rectangle-shaped from the NES controller. The American controller is slightly different from the Japanese and the PAL controllers. 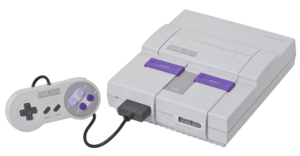 Instead of having each button be a different bright color, the and buttons were purple and the and buttons were lavender, tying into the mechanical color scheme of the SNES's American model. It has the , , , and buttons and the from the NES, plus four extra buttons: the , , , and buttons. 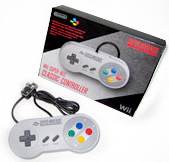 There is also a Wii adaption of the SNES controller for use as a substitution for the Classic Controller with games that support said controller. 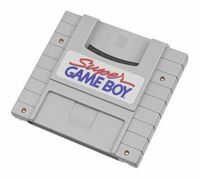 The Super Game Boy is a cartridge adapter that allows play of all Game Boy games, as well as Game Boy Color games that were made backwards compatible to work on the original Game Boy, on the Super Nintendo. Some Game Boy games are "Super Game Boy enhanced", such as Donkey Kong. The SNES Mouse was an accessory for certain SNES games. It was compatible only with the SNES and was thus only used in the early-to-mid-1990s. The SNES Mouse mimics the appearance and action of an actual computer mouse; the SNES Mouse controlled the cursor in some Mario games. The SNES Mouse was originally bundled with Mario Paint and a mouse pad for $59.95. The SNES Super Scope is a light gun accessory for the SNES. It has one "fire" button for shooting, either in single bursts or a constant stream, depending on whether or not its on/off switch is set to "turbo". It also has a second "cursor" button and a "pause" button. It was used for very few games, including one Mario title, Yoshi's Safari. The Super Multitap, by Hudson Soft, allowed to turn the player 2 controller port into four controller ports, allowing for up to five simultaneous players, but only if the game supports it. Although no Mario SNES game uses the Super Multitap, Wario Blast: Featuring Bomberman! for the Game Boy can use the accessory if played in a Super Game Boy, although the game never uses the fifth available controller slot. A Japan-exclusive add-on for the Super Famicom was the Satellaview. It was the earliest known, commercially available, licensed product by Nintendo to connect to the internet and download games. The Super Famicom Jr. is incompatible because of the missing port underneath the first model had. Only in Japan, the SF Memory Cassette is a rewritable version of regular cartridges, through kiosks at retail stores between 1997-2007. Over time, pins inside the SNES and game cartridges would get dirty. Nintendo released an approved cleaning kit to improve the condition of the contacts so games would play without interruption. Announced on June 26, 2017, the Super NES Classic Edition (known as the Nintendo Classic Mini: Super Nintendo Entertainment System in Europe and Australia and Nintendo Classic Mini: Super Famicom in Japan) is a smaller version of the Super Nintendo Entertainment System, and the successor to the NES Classic Edition. It comes with 21 pre-installed SNES games, including five games in the Mario franchise: Super Mario World, Super Mario Kart, Donkey Kong Country, Super Mario World 2: Yoshi's Island and Super Mario RPG: Legend of the Seven Stars. It was released on September 29, 2017 in North America and Europe, September 30 in Oceania, and October 5 in Japan. A spaceship shaped like the PAL version of the SNES appeared in the 1997 Club Nintendo comic, "Die Jagd nach dem Nintendo 64: Krawall im All". It was used as a metaphor, referring to the discontinuation of the console, and the launch of the Nintendo 64. In the comic, Mario and Luigi traveled with this spaceship, in search for a new one. During their quest they had to compete against Wario and Bowser who chased after the new spaceship as well. At the end of the comic, the spacecraft turned out to be the Nintendo 64 and the plumbers went on to take possession of it (abandoning the SNES-spaceship), being hailed by several of their friends. The SNES is also used as the setting for the microgame Super Nostalgic Entertainment System in WarioWare: Smooth Moves. In Donkey Kong Country 2: Diddy's Kong Quest, giant SNES controllers appear in both Monkey Museum and the Interior of The Flying Krock. Super Mario World had a Special Zone that used the logo for the Japanese and European markets. In Super Mario Odyssey, one of the filters that is available for use in Snapshot Mode is the graphics style of the SNES. Mario and Luigi's SNES-like spaceship. For the Australian Club Nintendo, it had a reward option to request a Classic Controller themed after a European SNES controller. ↑ Nintendo. Super NES Hookups. Retrieved July 1, 2017. This page was last edited on April 15, 2019, at 19:39.